We have blogged on here a lot about the need for forensic science reform and how the current state of forensic science with no meaningful oversight is not unlike the Wild Wild West. Consider this reporting from CNN. If these claims of CNN turn out to be true, it is just amazing. Perhaps we have found a new poster child for forensic reform? And if true, it serves as a stark reminder to check the credentials on everyone. 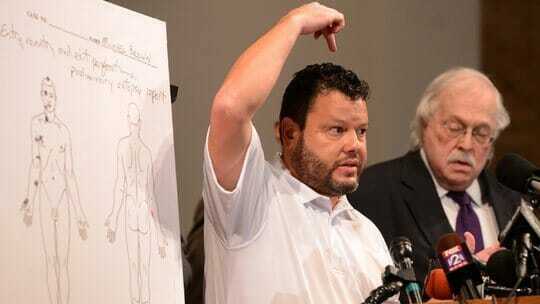 Is ‘professor’ who helped with Michael Brown autopsy who he says he is? (CNN) — The last thing an attorney might expect to receive at a deposition is a brain, but that’s what the man said he was handing over. A brain. In a bucket. Sliding the bucket across the table and opening the lid, the man urged the lawyer, Michael Hodges, to take it. Hodges declined. The deposition continued. This might have gone down as just on odd moment in Kansas legal history were it not for the fact that about a year later the defendant, Shawn Parcells, ended up playing an instrumental role in the case of Michael Brown, who was fatally shot by a Ferguson, Missouri, police officer in August. Parcells became an overnight media star in August when he assisted in an autopsy commissioned by Brown’s family. He appeared time and again on major media outlets as a forensic pathology expert. He said over the years he’s testified in court dozens of times in several states. But an investigation by CNN that included interviews with attorneys, law enforcement and physicians suggests Parcells isn’t the expert he seems to be. And handing a lawyer a brain in a bucket isn’t the only unusual thing he’s done. In 2012, Parcells Regional Forensic Services was hired by Andrew County, Missouri, to do an autopsy on Robert Forrester, 74, who doctors said died of a brain bleed. Police suspected manslaughter. Parcells told CNN he performed the autopsy on Forrester without a doctor present. On the first page of the autopsy report, it states that “this final autopsy report has been reviewed and signed by:” and then underneath there are lines for signatures for Edward R. Friedlander, M.D., a pathologist, and for Parcells. Friedlander declined to discuss the case with CNN. Parcells said he listed Friedlander by mistake on the first page of the report, and the autopsy report was actually done by Dr. George Vandermark, whose name appears on the next page — but Vandermark tells CNN he had nothing to do with Forrester’s autopsy. The report was never signed.According to the county, without a valid autopsy report signed by a doctor, a cause of death can’t be officially determined and no one can be prosecuted. Police took Bobby Forrester, who has a history of psychiatric illness, to a hospital for a four-day mental health evaluation. After testing, Bobby Forrester was released from the hospital. Nine months later, Forrester assaulted his grandmother, who was found lying on the floor bleeding with two swollen black eyes. He’s now serving a four-year sentence for assault. Parcells insists that the Robert Forrester death investigation was “doomed from the start” because the dead man’s body was embalmed prior to the autopsy, and because the sheriff’s department never turned over records needed for the autopsy report to be completed. The sheriff’s office says Parcells never asked for such records. Parcells, a Kansas native, says he became interested in death at age 12 when his grandfather passed away. Right after high school, renowned pathologist Michael Baden made a visit to Kansas. Parcells snapped a photo with him. He received a bachelor’s degree in life sciences from Kansas State in 2003, and he said he was immediately accepted to medical school in the Caribbean, but his wife got pregnant and he wanted her to receive her care in the United States, so he didn’t attend. Earlier this year, Parcells’ LinkedIn page said he expected to start medical school at the International University of the Health Sciences in the Caribbean starting in September 2014. Later, the date was changed to 2015. When CNN visited Parcells in his Overland Park, Kansas, home, he presented a photo of himself onstage at what appears to be a graduation ceremony at the New York Chiropractic College. “I got a master’s degree in anatomy and physiology, with clinical correlation,” he said. CNN: So that master’s degree in New York, you have that degree? Parcells: I will have it next month, yes. CNN: I don’t mean the piece of paper. I mean have you been conferred that degree? Parcells: Yes, I will. Next month. CNN: Right now, as we speak, you have that degree? Parcells: No, I do not. Parcells doesn’t claim to have any specific license or certification to do the work he does. He knows how to do autopsies from “on-the-job training,” watching pathologists and assisting them at various morgues, he said. Sometimes he’s been paid for this work and sometimes he wasn’t, he added. He certainly sounded knowledgeable and authoritative on August 18 when he presented the findings of the Michael Brown autopsy to a nationally televised news conference. “First of all, I’m Professor Shawn Parcells,” Parcells said as he stood to address the reporters. On his LinkedIn page and to CNN, Parcells said he’s an adjunct professor at Washburn University in Topeka, Kansas — but a spokeswoman for the university told CNN that’s not true. “(Parcells) is not now and has never been a member of the Washburn University faculty,” university spokeswoman Michaela Saunders wrote in an email to CNN, adding that at one point, Parcells spoke without receiving pay to two groups of nursing students about the role of a pathologist’s assistant and gave a PowerPoint presentation and answered students’ questions. Parcells says he sometimes performs autopsy procedures without a physician present, and that’s legal as long as he’s under a doctor’s supervision and the doctor signs off on the report. “I’m not coming up with the cause of death, and I’m not making the final diagnosis,” he said. At the same time that Parcells was doing autopsy procedures without a doctor, his company was distributing a letter saying he never did that. A March 5, 2012, letter addressed “To Whom It May Concern” outlines “myths” and “facts” about his company’s practices. “MYTH: Our pathologists are never or seldom present during an autopsy examination. Parcells told CNN that even though it’s on his company’s letterhead, a physician he worked with, and not him, wrote the letter, which is unsigned. Laws in Missouri and Kansas aren’t completely clear on whether it’s legal for someone who’s not a doctor to perform an autopsy procedure without a doctor present, but one thing is clear: Some coroners and law enforcement agencies aren’t happy about what Parcells is doing. Grant Gillett, a deputy sheriff in Andrew County, Missouri, said Parcells told them he was a doctor — a pathologist specifically — when he walked into the funeral home to do the Forrester autopsy. Parcells says he never told the deputies he was a doctor. Officials in another county in Missouri filed a complaint with the Missouri Board of Registration for the Healing Arts when they found out Parcells “conducted (an) autopsy with no pathologist present.” The board reviewed the complaint about the 2011 autopsy and voted to close the case. Pathologists interviewed by CNN say they’re concerned that a man who has no formal education in pathology is giving testimony in court that could possibly help put innocent people in jail or let guilty people go free. “I would certainly say questions should be raised about any case in which he has a part,” said Mary Case, the chief medical examiner for St. Louis County. As for the case where an attorney was handed a brain in a bucket, a Kansas widow who wanted to know the cause of her husband’s dementia sued Parcells after he told her he would remove her husband’s brain from his body and send it to Harvard Medical School for analysis. The widow, Judy Walker, said she paid Parcells $1,250 in 2011 but never received a report from Harvard. Her lawyer, Michael Hodges, said about three years later — after the lawsuit was filed — she received a report from a doctor in New York. Hodges said he’s not sure if the brain in the bucket belongs to Walker’s late husband, Michael Doris, or if it’s even a brain at all. “Plaintiff now believes that her husband’s brain has been lost or destroyed,” according to the complaint. Parcells says that’s why he brought Walker’s late husband’s brain to the deposition. And if she ever wants it, he says, it’s in his lab in Topeka, safe and secure.